Gourmet Bag Selection - in bag. 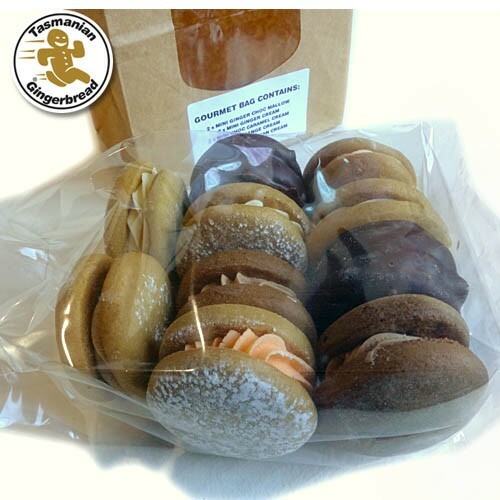 10 assorted mini gourmet range delights.A scaled down version of our gourmet classics. Contains two of each: Ginger Cream, Orange Cream, Chocolate Cream, Choc Mallow, Vanilla Bean Cream. Butter, Vinegar, Baking Soda, Ginger, Cinnamon. Some biscuits contain: Orange Oil, Orange Emulsifier, Raspberry Jam, Milk Chocolate, Marshmallow, Vanilla Bean Extract, Vanilla Bean Paste, All Spice, Cocoa Powder, Icing Sugar.